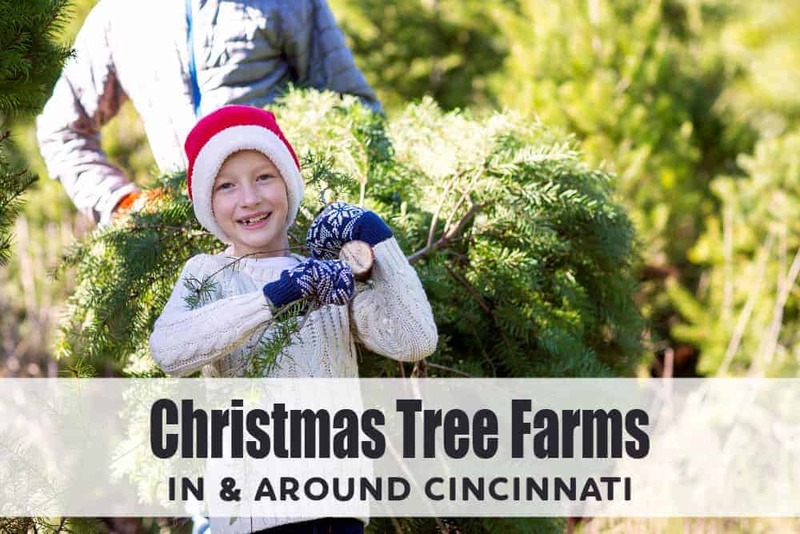 Hop in the car, crank up the Christmas music, and pay a visit to one of the many Christmas Tree Farms in Cincinnati this year. It’s a great way to officially kick off the season! We created a list of farms where you can cut your own Christmas tree. Let us know which one is YOUR favorite! Be sure to check out our Christmas Tree Farms Near Me map too! Tips: Be sure to call ahead and make sure the farm of your choice still has a nice selection and/or that their hours have not changed. Keep in mind that most farms do not accept credit cards – be sure to take cash. 40 acres of Christmas trees plus a 9 acre lake. Christmas trees you can cut include Canaan Fir, Scotch Pine, Blue Spruce, and White Pine. They also sell “harvested” Fraser Firs. Tractor rides are always free and operate from open until dark. Horse drawn wagon rides cost $1 per person and operate 4 days only = 11/23, 11/24, 11/25 & 12/2 from 9:00 am – 5:00 pm. Final tickets sold at 4:30. On weekends, actors re-enact Mary and Joseph on their way to Bethlehem. Wander 100 acres and choose from thousands of trees. All trees are the same price, cash or check only. Snap a family picture on the full size Santa sleigh. Petting zoo, life size nativity display, free rides around the farm in a one horse open carriage. Christmas Tree Farm featuring choose and cut trees as well as live trees for re-planting. Petting zoo. Tractor drawn wagon rides. Berningers have been growing trees since 1955 and they have hundreds of 6’+ trees. You can cut down your own or choose from a wide selection of pre-cut trees. Assorted variety of wreaths crafted on site with farm fresh boughs plus pine and cedar garland and roping. Free popcorn and hot chocolate. Bartels is a family-owned Christmas tree farm located on 124 acres nestled between Trenton and Oxford Ohio, within close driving distance from Cincinnati and Dayton Ohio. They have 10 acres of hand-planted Christmas trees, wreaths, live animals, hot chocolate, and more. Fields close at dark, but there are lights over the pre-cut, balled and burlapped trees for evening shoppers. They’ve been growing Christmas trees for over 75 years and currently grow over 60,000 trees on their 125 acre farm. You can choose to roam the fields looking for that perfect tree, find a pre-cut tree by the Christmas barn, or pick from a large selection of balled and burlapped trees to plant after Christmas. Enjoy complimentary hot chocolate and cookies. They also sell wreaths, swags, pine roping and arrangements made fresh daily on the farm. Trees, wreaths, and handmade Christmas decor. Complimentary hot chocolate. Cash and check only.